My Kuru Toga pencil purchase was an impulse buy – I was browsing Amazon.com looking for a gift for a friend when I noticed the Kuru Toga pencil set. I figured that my desk could use a touch of class and so decided to order it. At $3.88 it is a decent investment in a pencil considering that I can get 10 BiC mechanical pencils for $4.67. However I justified this extravagant purchase by noting the box of lead and two erasers (+1 in the pencil) that came in the package. Additional justification was provided by the fact that the lead was infused with diamond (!) and according to its description it is ‘the most advanced mechanical pencil ever‘. The Kuru Toga pencil’s highlight is the Kuru Toga engine – based on my non-knowledge of Japanese I’d say that the name comes from Kuru which means to turn and Toga which means to sharpen. I also found this out by searching Google for five minutes. True to its name, the Kuru Toga engine rotates the pencil lead a tiny bit every time you lift up while writing. This means that you’ll always have a sharp edge to write with as long as you remember to push down hard enough to prime the engine and lift up sometime during your writing. The rotation of the lead can be observed by viewing the logo through the translucent window or by squinting your eyes and looking at the lead while pushing the tip in and letting it pop out. In practice the Kuru Toga engine doesn’t always give you the sharp tip – it generally rotates to give you a enough of an edge to keep your writing sharp. The mechanism makes no noise and is generally invisible in its operation, just lean back and enjoy the sharpness of lead. The pencil comes in a package that looks exactly like the package shown on the Amazon website. There are two pieces of lead in the pencil and an eraser so the pencil is ready to go out of the box. The eraser is small and won’t last long, but when working at this level you really should have a separate eraser in your writing arsenal. The diamond infused lead is tough yet soft, it writes well like a HB grade should but doesn’t break and leave that annoying little piece in the tip like most other soft leads. Despite being almost all plastic, the pencil has slight-to-decent heft to it and is balanced towards the writing end. The eraser is visible through the translucent top which gives you a real time view of its status. Pulling the eraser off reveals a hole through which additional lead is inserted. The traditional backdoor of inserting the lead through the writing side is also supported, giving you two methods to support lead insertion. I’m pleased with the Kuru Toga pencil. The dark cylinder with the blue and chrome highlights adds style and a touch of class to my desk. The writing is smooth with a well balanced pencil. The build quality is excellent, much better than those 10 for $4.67 pencils. I carry it around with me and it just screams out ‘class!’ and ‘high technology’ in every meeting I attend. This is my first foray into the world of designer pencils so I don’t know if it is a good value but at $3.88 it doesn’t break the bank. I’ve had the Logitech Anywhere mouse for several months now and I am a heavy user. I use it for 8+ hours a day and carry it from my desk to meetings several times a day. I also take the mouse home with me several times a week when I have work at home. The features of this mouse reflect well on its premium pricing. In addition to the right and left click buttons, the mouse also has two button on the left side that can be mapped to different functions but usually default to forward/back in most applications. scoll wheel finger. Having a separate middle click button is great because you don’t have to worry about keeping the scroll-wheel steady while you middle click. In addition, the mouse uses a DarkField™ laser for tracking. The DarkField laser is designed to track on any surface and I can confirm that the DarkField™ laser is fantastic. I’ve personally verified that it tracks on any surface – tile, mirror, wood, couch cushions, and even a $2 mousepad from Office Max. The mouse has a great on-off switch that covers the laser on the off position which protects the lens and cavity. and sticks about 1/4 inch out of the USB socket. I leave it plugged in all the time, even when I’m traveling with the laptop in my backpack. There is even a small status light on the top of the mouse that lights briefly when you first turn on the mouse – it shows green when the battery is good and red when it is time for replacement. The mouse takes two batteries, but can run on just one – even at low voltages on a single 1.2v rechargeable battery. And one last thing – side scroll. The scroll-wheel toggles from side to side to allow users to scroll horizontally through long documents like spreadsheets and webpages. The Everyday mouse is incredibly well built. The buttons click with a snick and have excellent tactile feedback. The scroll-wheel has a ridged center with metal accents on the side. The sides of the mouse have a soft rubber with ribbed finish that makes it easy to hold. The on/off switch opens and closes with a satisfying click. It feels solid and well balanced in your hand. I highly recommend the Logitech Everyday mouse. I use it for several hours every day at my desk dnd carry it around with me. It has yet to let me down! I’ve been using the Samsung Galaxy S3 Mophie Juice Pack for about a month with my Samsung Galaxy S3. The Mophie Juice Pack boasts a 2300mAh battery that is slightly larger than the S3’s 2100mAh battery. It comes in white or black and consists of two pieces – a plastic hardshell with a USB port into which you slide the bottom of your S3. The S3’s power port then slides into the Mophie’s USB port. The Mophie USB port acts as a pass-through that charges the Juice Pack and phone battery, and allows USB connectivity to your computer. The 2nd piece slides over the top of the phone and snaps into the bottom. The case covers the whole phone and wraps around the front lip. It does a good job in terms of coverage. Besides covering the phone, there aren’t many features. There is a set of four white LEDs on the bottom of the case that are activated by a button next to them. Pushing the button lights up the LEDs to show how much charge is left in the Juice Pack. In addition, there is a small on/off switch that turns on or off the phone charging from the Juice Pack. Turning the switch on makes the S3 think that it is plugged into a power outlet and it draws power from the Juice Pack. In general day to day use, I leave the pack on to conserve my cell phone battery and I can expect the juice pack to last about a day with minimal usage of my phone. Minimal usage means turning off everything and then using wifi on for about 30 minutes spread throughout the day to check my email and general web browsing. This is pretty low considering that the S3 battery will go a full day and still have charge left over. Despite the premium price, the Mophie Juice Pack doesn’t have the feel of its $100 price. The plastic feels cheap and gets slippery after extended use. It is difficult to guide the phone into the USB plug and the top doesn’t line up with the bottom along its seams. There isn’t enough space around the headphone jack to plug in headphones with large plugs. One last thing is that the side buttons are very cheap. The power button on my case was locked inward which forced the phone into a endless reboot cycle after I inserted the phone into the case – I had to rip out the Mophie’s side button with a pair of pliers just to stop the reboot cycle and be able to use my phone. Not what I’d expect for a $100 phone case! I am very disappointed by the Mophie Juice Pack. It appears to be a $20 battery covered by a cheap $10 plastic case with 10 cent buttons that sells for $100. The fact that I can’t plug in headphones with large plugs and that the buttons can lock your phone into a endless reboot cycle makes the high price tough to swallow. Especially considering that I can get a 4200mAh battery for $25. Top and bottom don’t align! I bought the Sennheiser PMX 680 headphones from Amazon.com for $36 about two years ago. 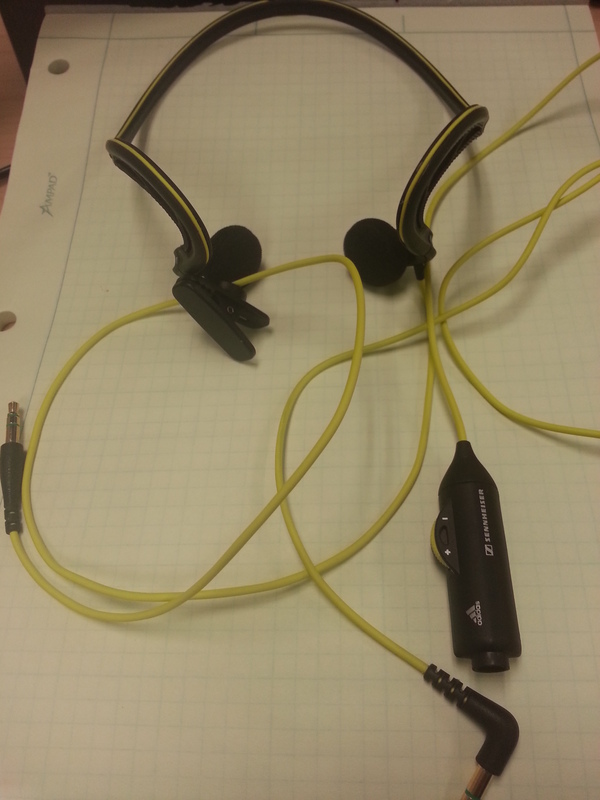 The PMX680 is co-branded between Senneheiser and Adidas and is designed to be and is advertised as workout headphones. Amazon says that the PMX 680s have been replaced by the PMX685i, however the 685i are quite expensive at the current price of $75 for a pair. I chose 680s headphones because I like Sennheiser, I have a pair of PX250s at my desk that I’ve used daily for almost 6 years. 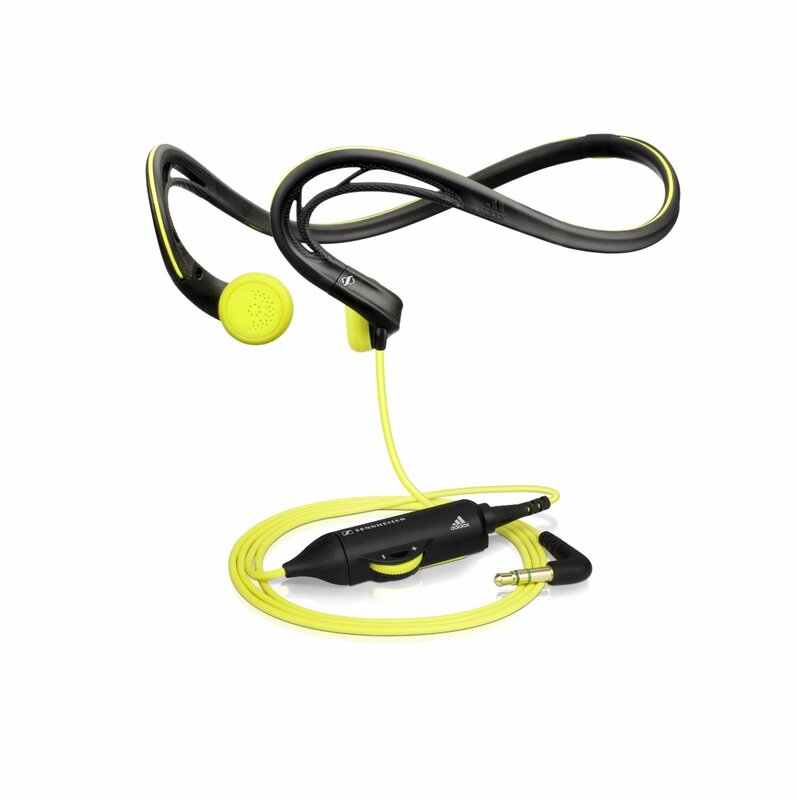 Aside from the foam around the earbuds getting a little loose, the PXC250s are still going strong. Well maybe not so strong, the noise cancelling module also died a few years ago. My PMX680s have stood up well over the last two years. I tend to baby them because they feel fragile, they are very light and the cord seems delicate. Despite the lightness the Kevlar lined cord is tough and can withstand a good jerk. The place where the cord enters the headphones seems unprotected and likely to pull out – there is a picture on the Amazon page where this has happened to a buyer. The headband wraps around my head and doesn’t get in the way. There is a small reflective stripe for visibility on the back for those that prefer outdoor activities on public roadways while wearing dark clothing. The headphones are not perfect. The single cord comes out of the headphones at a weird angle and ends up being annoying. It rubs against my chin requiring the use of the collar clip. The volume control module bumps back and forth against me when I run forcing me to run it under my shirt, the module is detachable but the headphone cord without the module isn’t long enough to reach my pocket where I keep my mp3 player. I think Sennheiser believes that we need volume control if we are going to put our music player in our pocket – as if sound normalization technology doesn’t exist. These two things, the cord and the volume module, make the headphones annoying to use and are a distraction in the gym. The sound is typical Sennheiser – flat with good reproduction. There is no detectable excessive base like Bose or high trebles like Polk. The speaker sound is not full and has a slightly tinny quality, this is probably because of the small speakers. I’m guessing the speaker size is constrained by the size of the earbuds which have to fit inside the average person’s ear. Making the headphones in the traditional style where they cup or go over the year would help with the tinny sound except that this would make the headphones annoying and prone to shifting. I think that the sound quality could have been improved by using stronger magnets or better magnets but they were probably nixed to save money. I’ve had no issues as I mentioned earlier. The PMX680 is advertised as sweat and water resistant and it has lived up to that promise. Unlike my previous pair of headphones which died due to excessive sweatiness, the 680s are still going strong. The foam around the speakers is starting to show wear but that is expected from regular use. I tend to baby them which may account for them still working. I try to keep them dry and carry them separately instead of just throwing them into my gym bag. However these headphones are rated 3.6 out of 5 on Amazon’s page with many of the reviews noting that they stop working after a while and that the volume control knob is annoying. Overall these are decent headphones with ok sound. The tinny quality of the sound, the cord rubbing against my chin, and the volume module are annoying. And the headphones are not very durable as reviews on Amazon indicate. I wouldn’t buy these headphones again – there is a lot of competition in this space and I feel that we are paying more than necessary for much less quality for the Sennheiser-Adidas brand. Another annoyance is that you have to purchase the headphones from an authorized retailer in order to get the “generous” 2-year Sennheiser guarantee. Naturally these authorized retailers charge more so if you care about the warranty then you’ll end up paying more. What bothers me is that ‘non-authorized’ dealers are also selling the same headphones. If they are not authorized then how do they get this headphones? My guess is that we end up paying for the guarantee thorugh the higher prices that the ‘authorized’ retailers charge. While we are on the topic of annoyances, the price of the PMX680s (a.k.a the PMX680i) with the microphone is $65! Really another $30 for a microphone?! Please support this site by using this link for your Amazon purchases! According to the ArduiNIX website, the “ArduiNIX shield is a user programmable platform for driving multiplexed Nixie tube or other high voltage displays.” I bought the ArduiNIX shield after I read about Nixie tubes and wanted to try them out. Nixie tubes are old-school tube based character displays that require voltages in the range of 150-200V to run. 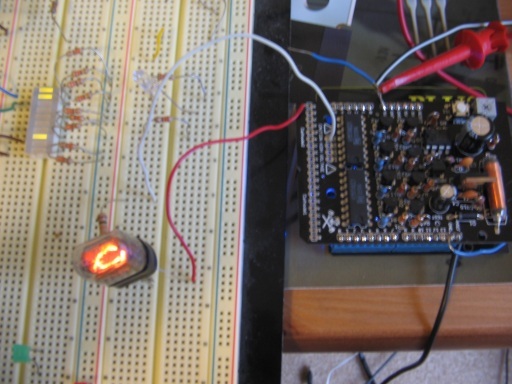 The ArduiNIX board has an on-board SMPS power supply that generates these voltages and it has the correct interface to drive Nixie tubes from a Arduino board. However, in my case I’m using a Netduino board to do the driving. The ArduiNIX is open source – the CAD layout files for the board and parts list are available on the site. In addition, there is a forum where users can ask questions and discuss issues. Once you consider the cost of acquiring all the parts and putting them together, the prices in their store are reasonable. You can buy a complete kit for $45 including shipping. The kit doesn’t include the NIXIE tubes. This seems reasonable because a user may want to use a different type of tube than the one they supply. You can get a fully assembled board for $94. Based on the ease of assembly, I think that purchasing a fully assembled board is not worth the price. Assembling the board took me about 2 hours and is straightforward. They have a excellent step-by-step tutorial on their site. All the parts are through-hole and are marked clearly on the PCB. Since there are many different value resistors, double check the resistances and be careful when soldering them into the board because it is easy to get them confused. Using the board is straightforward. You write your code, plug it into your Arduino or Netduino, and apply power. Looking at the layout of the ArduiNIX I see some definite areas for improvement. Based on the Nixie supply design and analysis posted on Nick Smith’s website, the ground plane is run under the switching supply inductor which causes energy loss. In addition, the ArduiNIX design uses very small traces. This does not provide the necessary low impedance paths between components. Despite these drawbacks, the ArduiNIX works well and is able to adequately power the IN-17 nixie tubes for which it was designed. I spend a lot of time sitting. I sit after I wake up, I sit all day at work and then when I get home, I sit for few more hours. Over time I’ve found that my chair, the Verksam from Ikea, wasn’t too comfortable for long periods of sitting. This was a top of the line Verksam with the armrests and orange suede leather chair for which I paid close to $300 about five and a half years ago. I have long arms and legs and the Verksam’s armrests never went down far enough for me to be comfortable. The seat didn’t push out far enough to support my legs, adjusting the armrests was a pain, and the chair was to damn hard. I read about the Herman Miller Mirra chair while reading Jeff Atwood’s blog a while ago. It seemed nice but it was pretty expensive so I forgot about. Eventually, I got tired of the Verksam and got tired of being tired. So, after reading a few more reviews I decided to purchase the Mirra chair. In my research I found out that Herman Miller has two yearly sales in which it cuts the price of if its furniture by 15%. The sales appear to occur at the beginning of June and around Christmas. I purchased a new fully adjustable Mirra chair with the tilt limiter and forward tilt during one of those sales from Amazon for $679. I highly recommend waiting for a sale if you are thinking of purchasing a Herman Miller chair, the regular price on the chair is $799 so you’ll save over $100 by waiting a few months. I received the chair a couple days after I ordered it. it comes in a huge box that weighs around 50lbs. It comes almost fully assembled, the only assembly required is to attach the back to the base using two bolts. One small annoyance is that you need a socket wrench to properly install the bolts – the bolts don’t tighten well enough and the back starts to wiggle if you use a monkey wrench like first I did. The Mirra has a suspended mesh bottom that supports the user very well. It has a slight give and molds to the shape of your bottom instead of forcing your bottom flat like a regular chair. The arms are soft and filled with a kind of a gel and are very comfortable unlike the hard or soft plastic most other chair use. In addition to adjusting up and down, the armrests also twist inward as well as move in and out. The material that comprises the back is very flexible. Unlike a traditional chair that usually has a hard or soft back, the Mirra’s back is flexible and molds to your back. In addition, the adjustable lumbar support lets you target the small of your back. The recline feature is very well built. As advertised, the seat tilts along with the back. However, unlike cheaper chairs where the back and seat feel bolted together, the Mirra seat tilts back at a different rate than the back so your whole body feels supported. The recline is so comfortable that I even like to relax in the chair. The tilt tensioner and limiter lets you dial the tilt to whatever you feel like for that day! One disappointment is the forward tilt feature. From the description you would imagine that the seat and back would tilt forward and support your body when you leaned forward but that is not the case. The forward tilt is just that – it is a lever that tilts the seat forward at a set angle and is not adjustable. It actually ends up being uncomfortable and is a useless feature. The chair has a several annoyances that I would not expect on a product at this price. The armrests wiggle within the in-out setting you chose even under light pressure. I would expect the mechanism to move the armrests in and out to hold the arms tighter. The arms don’t always lock at the height you select, the steps for the locking mechanism need to be tighter. In addition, the armrests don’t move in and out very smoothly, it takes a disproportionate amount of force to get them moving and you have a tendency to slam the armrest because of the force you use. Overall, once the chair is adjusted to your workspace these annoyances fade and you you don’t notice them as much. Overall, I like the Mirra. It is a great improvement over my Ikea Verksam chair. The Mirra is very comfortable and is highly adjustable. I can work in it for hours and thanks to the recline features is a great chair to relax in. It has some annoyances that I wouldn’t want to see in a chair at this price but they are unnoticeable once you properly adjust the chair. I was looking for ASP.NET hosting for the project I built to learn C#/ASP.NET. CrystalTech isn’t the cheapest host or gives the most features for your dollar but I decided to sign up because it is the host used and recommended by Jeff Atwood. I paid for 3 months in advance so I didn’t have to pay the setup fee. I was a member from July 2008 through February 2009. Signing up was easy. I filled out the online form, entered my credit card number, and they started on setting up my account. I finished applying at 8:18PM and had my account information at 8:58PM on the same day. CrystalTech’s control panel is the worst I have used. They make you log in with a hard to remember customer number instead of a easy to remember user ID. Instead of giving you a overview of your site, the main control panel page is a massive advertisement for their services. I am logged in now and I see ads for Paypal and virtual servers – and this is for a service that I’ve paid for! Even worse, the control panel has poor support for non-IE browsers, I cannot access any of the settings in the control panel with my daily browser – Opera. Visual Studio has a great GUI for transferring websites and I was easily able to use it to upload my files after I managed to set up a FTP account. Their uptime isn’t too great, I get maintenance notifications 1-2 times a month alerting me that my site will be down for a couple hours. Their last downtime notification was about 2 weeks ago, compare this with my linode virtual server that has been up for 46 days! Unlike all the other hosting companies I have used, CrystalTech makes you call in to cancel your account. Canceling online is not allowed. I was very disappointed with CrystalTech’s hosting experience. Their constant downtime, poorly designed control panel, and ads are a pain. In addition, they’ve graciously decided to spam me with their monthly newsletters. Their poor service is apparent when a little while after I signed up, they lost all the data that Jeff Atwood had stored on their servers. Since then, I’ve moved my site to Linode and set it up to serve ASP.NET pages using Mono. For about $12 more (1.5x more), I get a shell account, dedicated memory, 4x more bandwidth, 32x more disk space, and the ability to host unlimited websites. I would not recommend CrystalTech as a host.